As the season starts to change, my preference for booze changes, too. This summer has seen its fair share of fruity, chilled cocktails. Leinenkugel’s lemon-berry shandy pumped through my veins almost daily. I can’t count the homemade beer-garitas we enjoyed, and our foray into cocktails made with jam instead of simple syrup was quite delicious. The nights have turned a bit cooler, so it’s time to reach for rum. Rum is going to get me through this year’s harvest. I dread this time of year. My husband works long hours to harvest, and because I can’t stand the thought of him getting tired on a combine and accidentally hurting himself, I often work with him. However, this year might be our last year harvesting together. We found out we’re moving again. Yup. We are 80% ridiculously excited, because, you see, the plan was always to move back home to the South. We settled in the Kansas City area a little over one year ago for two ridiculous job offers (one for me, one for him). We’ve been just fine, but let’s face it: we are still an 8-hour drive from family. The other 20%? We’re a teensy bit sad. We love our brand new house. We love our neighbors. We love our friends here. We’ve made more friends in 1 year than I made in my 7 years in California. This is a testament to the warm friendliness of Midwesterners. I was watering my hydrangeas in the front yard last week, and a woman from down the street walked right in my yard and introduced herself. True story. We don’t know where or when we’re going. Thankfully, this lay-off came with 5 (and counting!) new job offers. We are surely blessed. Soon, we will be traveling around and entertaining the idea of living in each of the cities. As we’re touring houses, I’ll be squinting my eyes in each kitchen and trying to imagine myself baking biscuits in it. 2. a state with loose liquor laws. Hey, I’m still in my 20s and I don’t have kids—these are my priorities at the moment! If I told you all the things I had to do to find a small bottle of dark rum in Kansas for these skinny buttered rum cakes, your priorities would be much like mine. I frequently have to leave groceries in the car (hello, raw chicken) while popping into a liquor store. Why does Kansas hate rum? Rum should be shared pirate-style—generous and free-flowing! Get it together, Kansas! I’ve also been drizzling this on toast at breakfast. When you open the bottle, it smells like rich, buttery goodness. I can’t get enough. Preheat the oven to 350 and line a cupcake pan with 4 liners on the outside edge. In a small bowl, stir together the oil and sugar with a whisk. Add the egg and whisk until incorporated. Add the rum and whisk to combine. Sprinkle the flour, nutmeg, baking powder and salt on top. Stir the dry ingredients in to combine. Don't over-mix. 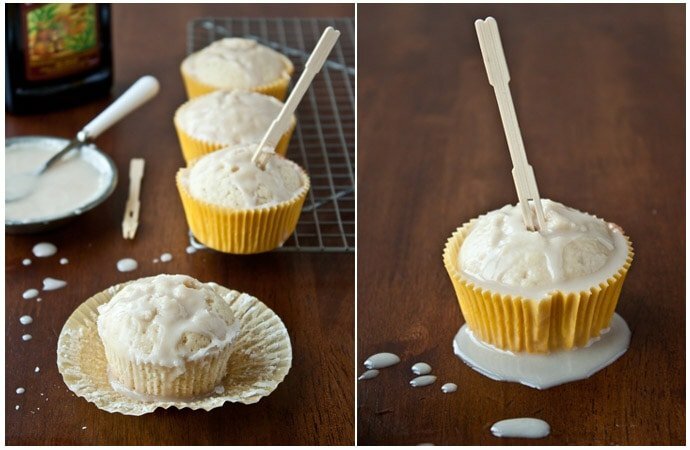 Divide the batter between 4 cupcake liners and bake for 14-15 minutes. Test for doneness and be careful not to over-cook because they will continue cooking as they cool. Let stand in the pan for 1 minute. Meanwhile, whisk together the powdered sugar and rum for the icing. If it doesn't flow freely, add an extra tablespoon of rum or milk. The glaze should drip off the edge of a spoon. Move the cupcakes to a serving dish. 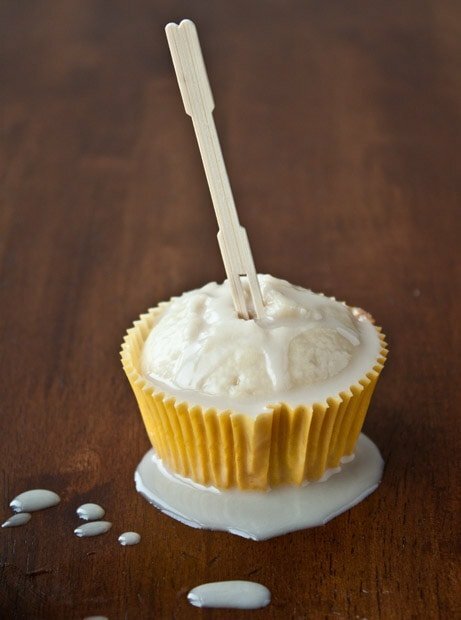 Poke holes all over each cupcake with a toothpick, and then drizzle the rum icing all over the top. Serve warm. Disclaimer: I was provided with product from Star Fine Foods for recipe development, but the opinions expressed here are my own. I just got that oil and am posting about it Thursday. Love it. Your cakes look amazing!!! Loose liquor laws and good produce. I’m not in my 20s and do have a kid and that’s still a priority :) I remember when you guys moved. And when you were living in CA – feels like yesterday. Pinned! How exciting for new possibilities! Bittersweet I’m sure but what a journey to go on bring newly married. So much going on right now for you guys, I hope you find the best place to live. I may not drink, but I LOVE cooking/baking with good booze. So I think your priorities are spot on!! LOVE the buttered rum cakes. They look killer! Your move sounds so exciting! These cakes look incredible! 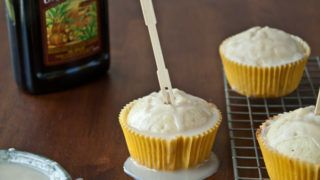 I have a little rum left over from the weekend (it’s readily available in England) so I will definitely be making these! Oh, I’ll definitely keep the two of you in my prayers that God will lead you to the perfect place. I am able to look back and understand why we were placed in each community during the past 26 years. When we were first married, we were 14 hours away from family, and while I didn’t care for that, I also look back and know that it was the best thing that could have happened. Although, we were in the south and came back to the north, which wasn’t fun. I still look at my momma every. single. winter and wonder/ask her what in the world she was thinking when she came north to college (and then stayed up here). I’ll hope that you don’t have to stay permanently in the “God-forsaken north” (as my grandmother called it until her dying day) and that you can find some dark rum (which is the only type of rum to have). And I did not like harvest season. Daddy used to spend such long hours at the elevator. He never saw our Halloween costumes, because he would have to spend the night at the mill in case of fire. No one really understands how difficult farming can be. Hang in there. God has great things for you. Oh, Julie. Thank you so much for the kind words. You & Steph are my favorite people I’ve met through blogging. I thought you might get a laugh out of this: Brian got a job offer in Fargo. After he stopped laughing, he said ‘my wife is from Texas. If you want me to move to Fargo, YOU be the one to tell her.’ It was settled. A place that gets more feet of snow than my height is O-U-T.
Christina: I am sorry about the layoff and your leaving your beautiful kitchen and home. Good luck at picking the best job and location for you both. If Brian was offered a job at North Dakota State University in Fargo, he would have been involved in amazing agricultural research. Farmers in North Dakota’s Red River Valley raise the best potatoes and sugar beets. I grew up on a farm closer to the Canadian border, and my dad was “a wheat man.” I will always remember him standing in his crops of waist-high wheat, checking the kernels. I hope that you and Brian get to see North Dakota someday. Someone here said that farming is difficult, it is also dangerous, but I am so glad that I grew up in a farming community. I’s proud to say that I am the great-granddaughter, granddaughter, daughter, cousin and friend of good, hard-working North Dakota farmers. You two are absolutely in my thoughts and prayers! Putting family, your biscuit baking area, fresh produce, and rum first sounds like you have your priorities in order :) Can’t wait to see where you two end up–you’ll make the right choice! Keeping you in my prayers, for sure! How exciting, though! But I know even then, things like this can be bittersweet. I hope the transition goes well for you guys. And these buttered rum cakes? GIMME. I am excited for you guys to start something new, refreshing and since you have your priorities down – I am sure it will be awesome. Both of you are in my prayers and hopefully you will bring us back good news :) :) I have to look for that olive oil. Sounds like you two have new adventures on the horizon. Sound so exciting! Wishing you an easy transition. BTW – these cupcakes look so tasty – and it sure doesn’t hurt that they have rum in them – lol! Yay for change! Moving closer to family is the best. Good luck with the harvest. A good grocery store and a state with loose liquor laws is definitely high priority! I love it. These cupcakes sound delicious. Even Missouri’s liquor laws are much more loose than Kansas – goodness I remember those. I’m glad you went out of your way for rum, though. It is perfect for this time of year and these muffins – so amazing. And good luck on the city-house-job-grocery store-search. I’ll be praying for you guys. You both are amazingly talented and I know you will shine wherever you are! It sounds like very positive change is in the air for you two lovebirds! Having the opportunity to be selective about where you live is majorly important, and your two location preferences would definitely be on my non-negotiable list too. Congrats on the new life change, and kudos to you for having such an up-beat attitude! Now gimme a buttered rum cupcake! ;) Big hugs, lady! All the best to you and your husband..I’ll keep y’all in my thoughts for sure. I hear Georgia is a great place to be. :) In the meantime, please send me a dozen of these here cupcakes. Just said a little prayer for you guys–that you’ll be led to the best place possible and that you’ll find great community and more joy than ever expected there! I understand completely the mix of excitement and sadness that comes with decisions like this. Praying you’ll have clarity and peace as you make the decision. I’ve been trying to pace myself on the butter olive oil, but let’s face it, I really just want to drizzle it on ALL THE THINGS. Whoaaa – I’m totally sold and yayy for you. Congrats on your new adventure and now i’m on a venture to get that butter flavored olive oil. SO excited to see where you two end up. These look fabulous!! If you come to Arkansas, bring a fewish dozen, mmkay? Skinny and rum…yes please!! Packed in a cupcake, I’m in heaven! Christina, I’m praying for job offers and homes with suitable kitchens to come your way… farther South & closer to family. Best wishes, sweet one. I’m so sorry for the bittersweetness…you guys are truly going to look back on these days as some of the hidden sweet moments though! OMG I can’t believe you guys are moving again! I hope it is a location where you guys can plant some roots. Maybe jump on the baby bandwagon…. Just sayin! Ok, butter flavored olive oil? I have to find this. I definitely laughed out loud at the “rum should be shared pirate -style” comment. Too funny! Moving is tough but the adventure is always the fun part. 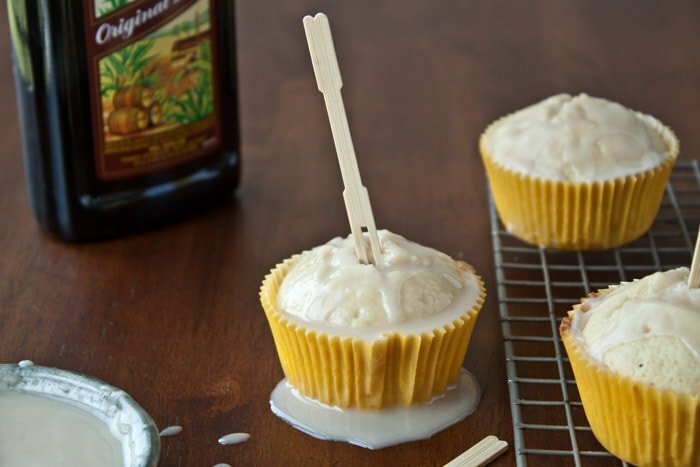 Love the fact you used buttered flavored olive oil in these cupcakes! Holy yum!!! Rum cakes are my favorite, these look so good! I have friends here in Oregon that own a jam shop and they have these jam cocktail parties and they are so dang amazing!!! And moving, it’s always an adventure and it sounds like you better stay out of Mississippi, Alabama, Arkansas and Oklahoma…we can’t ship any wine there because of their antiquated laws! But rum cakes…yummo…bring on Fall. PS the Jam cocktail parties sound amazing! I just got this olive oil too and can’t wait to use it!! Now I need to try drizzling it on toast! YUM! Moves can be hard – I don’t envy you. But at the same time, it sounds like a new adventure awaits! Celebrating with these rum cakes sounds like a pretty fabulous idea. Just imagine if you lived in Canada and always had to go to a separate store for liquor. I tell you, every time I’m in the states I fall in love with buying my groceries and booze all in one spot! Butter Rum was my favorite Life saver’s flavor growing up. I remember getting them every Christmas. Moves are never easy but sometimes, they’re for the best. I’m sending a lot of good vibes your way! I hope you end up somewhere lovely with equally as welcoming friends and neighbors. :) You can make them these cupcakes. I’d gladly accept them if we were neighbors. These rum cakes look fabulous! 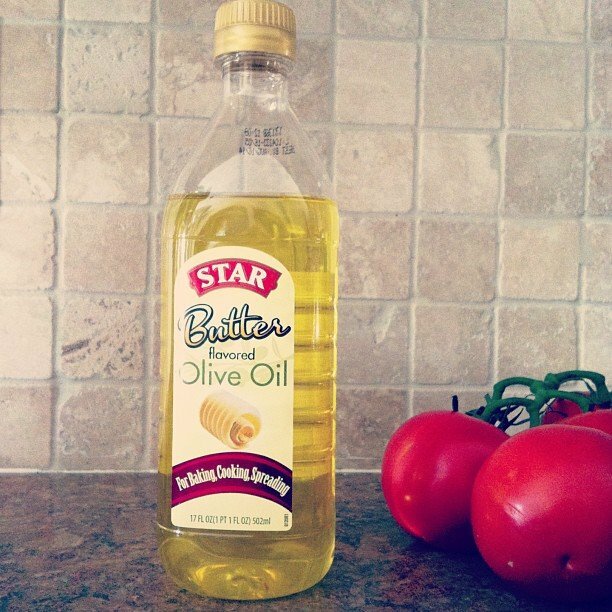 We love this creative recipe using our Butter Flavored Olive Oil! Hi Christina. I’m so, so sorry to hear about the layoff and the bittersweet experience of needing to move sooner than you had planned. But it’s wonderful that this has opened the door for so many new opportunities and that you’ll now be able to be closer to family. Good luck as you and your husband decide where to continue your adventures! And these rum cakes — YUM! Rum was the first alcohol I actually enjoyed so I am sure these would be right up my alley (took me much longer to come around to wine, and I still don’t know how I feel about beer). But rum was always a favorite. It’s a good thing that these rum cakes are skinny — and that this recipe makes a small batch. I’m not sure I’d be able to restrain myself from eating too many. Thanks for sharing this yummy-looking recipe. These cupcakes look amazing – the glaze on top is selling me! Good luck in your new location, I know moving can be hard! I just wanted to let you know that My husband and I have been looking into moving South and every time my husband comes across a job he is interested in I Google the city and how far it is from Trader Joes or Whole Foods. And I have three kids. Or a blog….. I have always wondered about that butter flavored olive oil! But if there is skinny, rum and cake in the same sentence? Yea, I’m there. Pinned! Love these! So many great flavors happening! I love buttered rum and could eat these all day, I’m sure! Love that they’re skinny! I just made these!They were delicious! 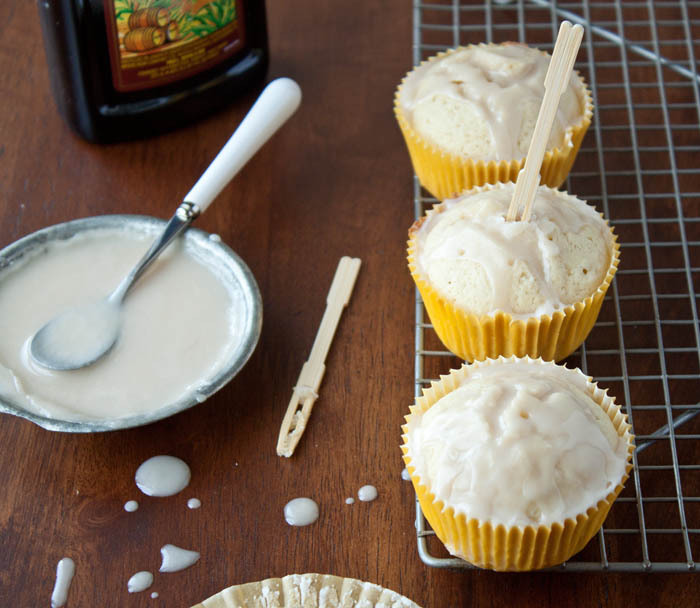 I did not have Butter flavored oil so I melted 1T butter then add olive oil to make the 1/4 cup – I also added a bit of cinnamon and I cut back the rum in the cupcake ad added a bit of vanilla – those flavors reminded me of the rum cakes you get in the islands! Thank you so much for this blog! It’s just my husband and me and I always hate to make a ton of dessert – these recipes are perfect! I will be trying them all!